Reporting your net worth can be beneficial for understanding ones current personal finances. For years my wife and I have been tracking our dividend stocks and reporting our status every month. While these reports are great, they don’t include our other assets like 401K accounts, 529 college savings plans, our home value, etc. By reporting on our net worth periodically, we are able to include these other asset categories. In addition to all of our assets, net worth also gives us an opportunity to look at our liabilities at the same time. Things like our mortgage, car loan, and credit card balances help show the amount of money that we owe. 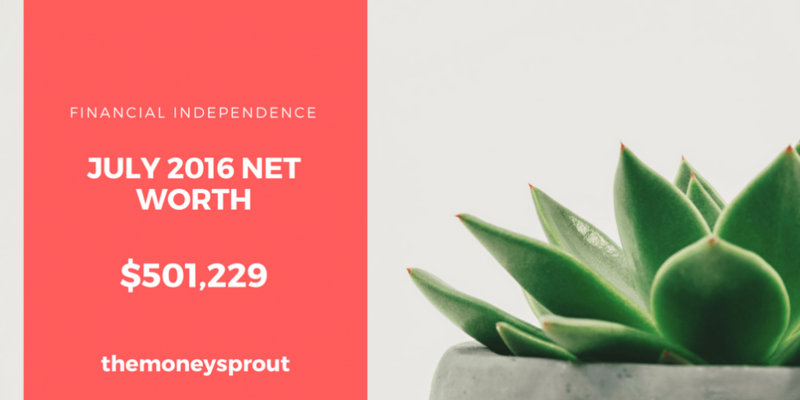 As of July 11th, 2016, our net worth is $501,228.83! As I have mentioned many times in the past, we don’t like posting these net worth updates every month. However, this past month was an exception as we crossed a significant threshold and wanted to highlight it. For the first time ever, our net worth is half way to 1 million dollars (at least on paper). I am almost certain we will fall back below $500K at some point – especially if the stock market corrects anytime soon. However, it is a milestone for now and we want to share. Our net worth in July 2016 rose by 4.5% compared to last month (June 2016). That was an increase of $21,546.74 over the past 5+ weeks. We have been investing a lot of new money into our dividend income portfolio and expect to see huge gains over the next decade. This will ultimately push our net worth higher and higher as we will continue to reinvest dividends and gains back into more shares of dividend stocks. As I mentioned earlier, the stock market has been on a wild tear and as a result our investments have grown by over $10K since last month. About 20% of these gains has been from new investment dollars, while the other 80% are from reinvested dividends and gains in share price. We fully expect the stock market to correct and will welcome the opportunity to invest in deep discounted bargains if the opportunity arises. One important thing to point out is that we are not really focused on the value of our stocks. Instead, we are focused on purchasing quality shares of stock that will pay dividends for many years to come. The only time we report on the overall value of our investments is for these net worth updates. Unlike our last report, this month we increased our cash reserves by over $350. I have mentioned it several times here, but I am not a huge fan of reporting on our home value in our net worth. However, it is one of our largest assets so we need to include it. A $9,000+ increase in home value in less than 2 months tells me that these estimates are just that. They seem to fluctuate a little too much for me. However, I do believe the latest estimated home value reported by Zillow is accurate. Despite the limitations of reporting our home value, it is kinda neat to compare it every couple of months. Overall, our home value had a jump and our total investments went up from new investments and the stock market increases. Our cash balance also had a little increase in value compared to last month. Every once in a while, I think it would make more financial sense to rent a home instead of having a mortgage. Owning a house is not cheap but it seems like the best option for our family to raise our 3 children. Even though it would probably save us a bunch of money – I just can’t imagine living in an RV with our kids. Home ownership is something that my wife and I value and a trade off we are willing to make. Overall, our 30 year mortgage rate is not too bad. We have 22 years, 7 months to pay it off and are always looking at refinance options. In the past we have paid extra on our mortgage – which knocked off 21 payments on the life of our loan. Since we have a fairly low rate for a 30 year fixed mortgage, we no longer pay extra on the home. Instead these funds are used to invest in dividend paying stocks. This could certainly be a debate on whether to keep paying extra on our mortgage or invest? There were actually 2 mortgage payments made (June and July) in between our reporting periods. As a result, we knocked off almost $800 from our principal balance. Just like our mortgage, we made 2 car payments between reporting periods and knocked almost $650 off our balance. Our credit card balances fluctuate a lot month to month, so an increase of over $250 is not that big of a deal. We would like to get our monthly balances to stay below $3,000 but this will take some sacrifice from our monthly budgeting. Since last reporting, both our mortgage and car loan balances dropped – as expected. Our credit card balances went up a little in the past month. I normally don’t post these net worth updates every month, but this time was the exception. For the first time ever – we pushed pass $500K! All that excitement will likely come back to reality as we experience the ups and downs of the economy and stock market. However, that doesn’t take away any excitement for hitting this milestone. As long as we continue to focus on increasing assets and lowering our liabilities, we should have no problem reaching $1,000,000 some day in the future!